The color combination of bright green and black on this top is absolutely striking! 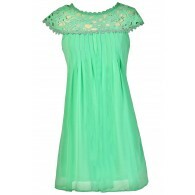 The Green With Envy Black Lace Top is fully lined and crafted of a floaty chiffon-like fabric. It has a thick black banded empire waist amped up with gold metallic studs. The straps of this top are crafted of black crochet lace that continues onto the back, adding a gorgeous detail everyone will notice as you walk away. The Green With Envy Black Lace Back Top is perfect for casual days or nights out with friends. 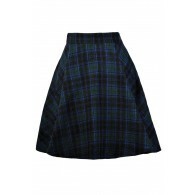 It can be worn with denim or paired with black fitted cigarette pants for a fun look. Toss a black jacket or cardigan sweater over this top if you’d like more coverage—this is one that can be layered and worn many different ways. Fully lined. 100% polyester. Hand wash cold. Do not dry clean. Small measurements: Length from top of shoulder strap to hemline: 33”. Bust: 32-34”. You have added Green With Envy Black Lace Back Top into Wishlist. You have added Green With Envy Black Lace Back Top for Stock Notification. You have set Green With Envy Black Lace Back Top as a loved product. You have removed Green With Envy Black Lace Back Top as a loved product.